Work on IJM Land Bhd’s RM4bil integrated mixed-development project The Light Waterfront along the Tun Dr Lim Chong Eu Expressway is expected to commence in the second quarter of next year. 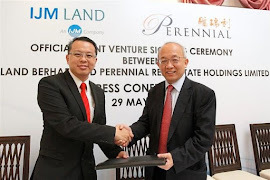 Its senior general manager (north region) Datuk Toh Chin Leong said the project, to be jointly developed with Singapore-based Perennial Real Estate holdings Ltd, would comprise a convention centre, retail mall, two four-star hotels, condominiums and an office tower. “The development cost of the project is RM3bil and will take us seven years to complete. “The convention centre will take four years,” he said. He said this to reporters after attending a signing ceremony between IJM Land managing director Edward Chong and Perennial Real Estate chief executive officer Pua Seck Guan. Also present were Penang Chief Minister Lim Guan Eng, who witnessed the signing ceremony, and IJM Corp chief executive officer Datuk Soam Heng Choon. Meanwhile, Soam said the commercial and entertainment project would serve as the flagship scheme under IJM Land.